Azoomee (the trading name of Tinizine Ltd) is an award-winning online platform for children aged 5-10. It is a safe and secure space for them to watch, listen, play, learn, make, do and share. Azoomee is currently available through multiple partnerships including O2, Vodafone and Amazon. In 2018 it started its international expansion. Now the company aims to raise up to £2 million under EIS to support its next phase of growth. What does Vodafone see in Azoomee? Watch a video interview with Vodafone Malta CEO Sonia Hernandez (this video is not produced by Wealth Club). Azoomee, which means ‘safe haven’ in Japanese, was founded in 2014. Through the ad-free Azoomee app, available on a monthly subscription on any mobile device, children aged 5-10 can access videos, games, activities, learning content and audiobooks along with a creative toolbox, all carefully selected by children’s media experts, teachers and parents. Content is curated and designed to be fun and appealing to children, keeping them away from platforms with potentially inappropriate content (for example on YouTube). Opportunity for a personalised experience by creating your ‘Oomee’ – your own avatar. Azoomee is now seeking up to £2 million under EIS to bolster its team, expand its content library to support its international growth and increase its marketing expenditure to further build brand awareness. This offer is exclusively open to experienced Wealth Club investors. Azoomee was founded and is led by husband and wife Douglas and Estelle Lloyd. 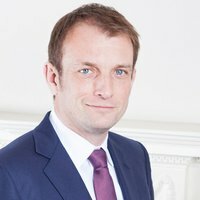 Douglas previously enjoyed a successful career in investment and finance with experience in venture capital and M&A within the tech sector. Estelle worked as a specialist in the technology and media investment banking industry for 10 years. Before Azoomee they co-founded and grew VB/Research, a digital media business they sold to FTSE 250 firm Centaur Media plc in 2011. Douglas and Estelle’s ability to secure partnerships with major international corporations and ability to commission, produce and create award-winning content has been central to Azoomee building a strong presence in the UK rapidly, and laying the foundations for international expansion. The Company launched as a consumer product in July 2016 under a partnership with O2. The Azoomee app was (and still is) preloaded on family tablets sold on the O2 website and retail stores. With each tablet, customers receive an Azoomee voucher providing a two-year subscription. So far c. 10,000 vouchers have been redeemed, with subscriptions paid upfront by O2 to Azoomee. In November 2017 it launched a children’s video channel on Amazon Prime Video UK under a revenue share model with Amazon. Active monthly subscriptions have grown consistently and are forecast to continue to grow. In May 2018, Azoomee made a successful application to join Tomorrow Street’s global innovation accelerator programme, created by Vodafone in partnership with Luxembourg’s national incubator Technoport. The partnership could have a significant impact on Azoomee’s growth as Tomorrow Street assist with high-level introductions and access to telecom companies both inside and outside the Vodafone group. The partnership is already proving beneficial. In partnership with Tomorrow Street, Azoomee has launched commercially in Malta and South Africa and is in discussions to launch in 14 other markets, with four more expected by the end of FY20. By that point, Azoomee expects to be generating meaningful revenues from at least six Vodafone operating companies. The Company is also in the final stage of a tender process with a US telco giant with a view to rolling out the platform in North America during 2019. Azoomee has so far generated the majority of its revenues through commercial partnerships with blue-chip companies and expects to continue doing so in the forecast period. That said, it also generates revenue through the direct to consumer channel. The Azoomee app is currently available across Apple’s App Store, Amazon’s mobile Appstore and Google Play in over 110 countries, with monthly pricing ranging from £5.45 to £2.25 (£4.99 in the UK). The app has been well received to date, with a rating of 4.3/5 (higher than Netflix) in Apple’s UK App Store, where it was also featured as “App of the Day” on 11 May 2018. The company is generating revenue but currently operates at a loss. It expects to hit EBITDA profitability in 2020 – not guaranteed. The target returns for investors are 6-9x (before EIS tax relief) after 2022 – returns and timeframes are not guaranteed. This is based on a range of EBITDA multiples from 8x to 12x. To achieve this the Company needs to successfully execute several opportunities within its telco pipeline, complete its negotiations with several cable operators in the US to launch Azoomee TV in North America, and achieve a significant increase in direct downloads and subscriptions. It is an ambitious growth plan. However, the market opportunity is substantial and Azoomee could be in our view well placed to exploit it given there seems to be a lack of direct competitors in the 5-10 age market segment and progress made to date. Success is not guaranteed: experienced investors should form their own view. Azoomee operates in a fast-growing industry with well established trade buyers and institutional investors. The exit options for an internationally scaled EdTech multi-media content provider are numerous, including a trade sale. Many traditional educational businesses are looking to invest in and acquire businesses that enhance their digital capabilities. Large operators in the entertainment industry, which may not have as strong a brand in the children’s segment, may look to acquire businesses to enhance their digital offering and brand in this growing area of the market. Exit options and timeframes are not guaranteed. Investors are investing in the company directly so will pay no direct initial or ongoing charges. Tinizine Ltd (trading as Azoomee) will pay an introducer fee to Wealth Club of 6% as well as a performance fee on exit – please see the offer documents for more details on the fees. When we met with Douglas Lloyd, his passion for Azoomee clearly came through. Significant progress has been made by Azoomee to date, particularly in agreeing contracts with O2 and Amazon, as well as the important partnership with Vodafone’s Tomorrow Street. The award-winning Azoomee offering has been well received to date, including winning innovation of the year in 2016 at the British Small Business Awards, ranking 33/100 in the Startups 100 list in 2018 (up from 56/100 in 2017) and featuring as App of the Day in Apple’s App Store in May 2018. The margins are strong and the key to driving growth will be turning the discussions with several large telcos and cable operators into signed contracts. Completing with a large telco or cable operator could have a significant effect on the business, as once a large operator takes on a product, others tend to follow suit. 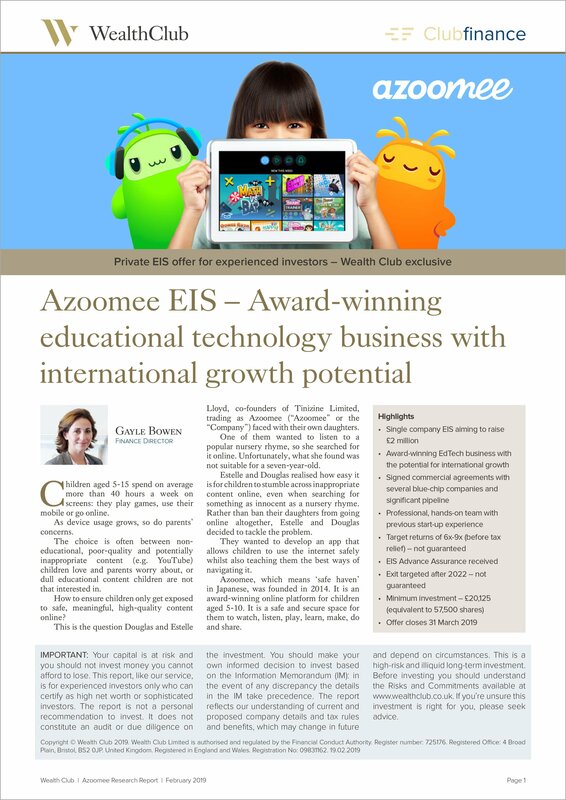 Institutional funds and trade operators are very active in this market and if Azoomee continues its current trajectory, bolstered by additional funding, and is successful in delivering its plans it could potentially become a leading global brand in the children’s EdTech market in the 5-10 age group. Experienced investors have an opportunity to participate now while the business seems to be at a sensible valuation but has already established its brand and proven its concept and potential: note however there are no guarantees of success. Apple, the Apple logo and iPhone are trademarks of Apple Inc., registered in the U.S. and other countries. App Store is a service mark of Apple Inc., registered in the U.S. and other countries. Android, Google Play and the Google Play logo are trademarks of Google Inc.